Launch new Shield MotionSense™. Educate and demonstrate how MotionSense™ Technology is activated by movement. Driving lead generation and product trial in-store, across the country. We move more than we realise. Our daily activities add up. With New MotionSense™, the more you move the more it works. Create digital experiences activated by physical movement using motion tracking technology to demonstrate how Shield MotionSense™ works. Bursting microcapsules “bubbles” in various digital gameplay applications. 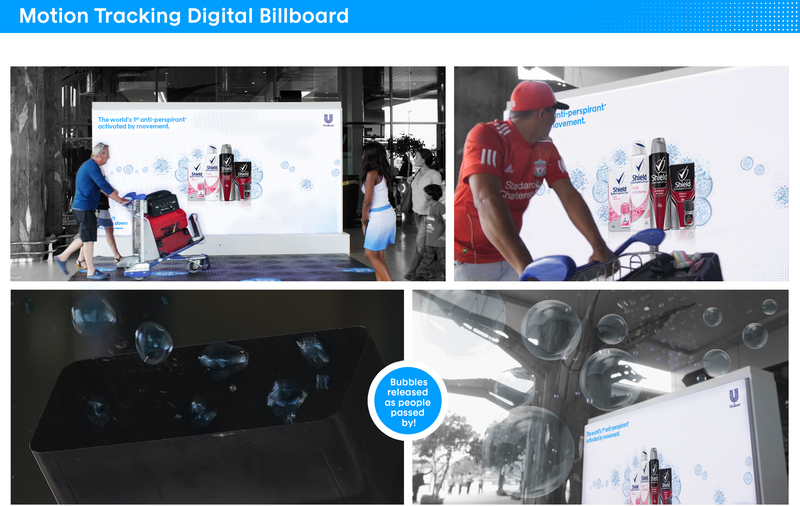 Activated across South Africa, in high traffic areas our motion sensing digital billboards surprised passers-by, with bursting microcapsules tracking their every move. To amplify the activation experience, a bubble machine on-billboard released real fragranced bubbles, delighting players and onlookers who took to popping them. Attracting their attention, we invited them to play our tablet game and enter their details to win a grand prize. Making use of the device’s accelerometer, the player shakes the tablet to burst as many microcapsule “bubbles” as possible within the 60 second time limit. In-store our tablet app created fun, promotional gameplay in an otherwise dull promoter space. The more they moved, the more they were rewarded. 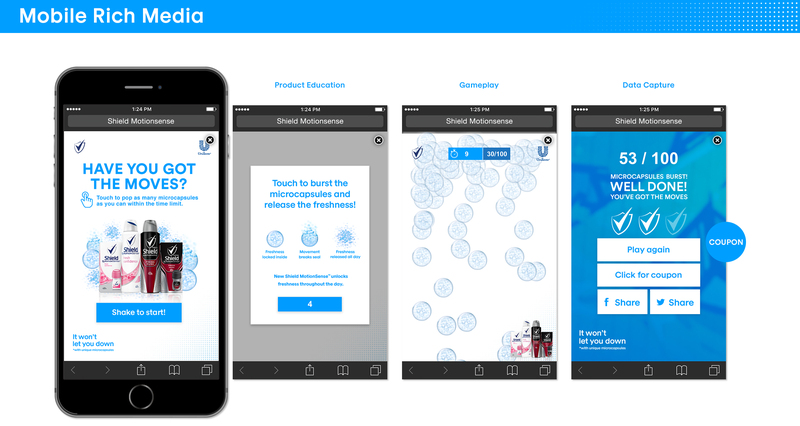 Online we targeted mobile users with a Rich Media execution. Challenging players to tap to burst as many microcapsule “bubbles” as possible and claim a coupon redeemable in-store while getting their bubble popping fix.